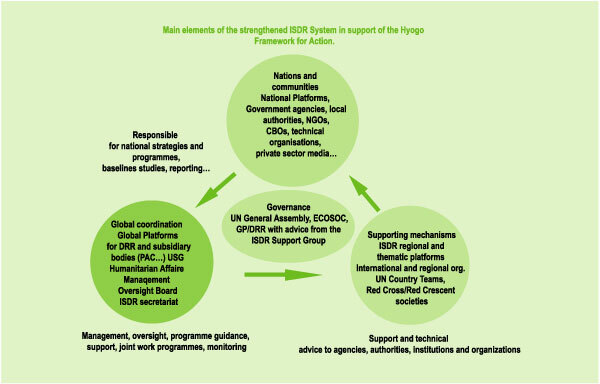 Thematic platforms or networks of expertise, in support of priority areas identified in the Hyogo Framework, led or supported by the Global Platform (Scientific panel/s to be developed). As part of the preparatory process for the first GP/DRR (scheduled for mid 2007), preliminary regional discussions are being organized by the ISDR secretariat in Africa, Asia, Pacific, Latin America and the Caribbean and Europe. These informal and focused discussions will involve regional inter-governmental organizations with support from relevant regional partners and the regional representatives of the ISDR Reference Group. The meeting for Latin America and the Caribbean was held in Panama on the 29-30 of June, with participation of key UN agencies and regional and sub-regional partners (see page 8). In January 2005, on ocassion of the World Conference on Disaster Reduction, a plan of action was agreed upon for the next 10 years, in which 168 governments committed themselves to advance disaster risk reduction by identifying five main priorities for action. This new plan is titled the Hyogo Framework for Action 2005-2015: Building the resilience of nations and communities to disasters. The Framework calls upon all States to take on the responsibility of implementing this plan, and outlines specific activities and mechanisms for making progress on the five priorities for action established. Likewise, with the purpose of assisting countries in fulfilling the commitments adopted in Kobe, the international community started a process aimed at strengthening the International Strategy for Disaster Reduction system, in order to have a more efficient mechanism for disaster risk reduction at all levels. In this context, the UN/ISDR is holding consultation meetings on all continents to make progress on the creation of the forum: the titled Global Platform for Disaster Risk Reduction with participation of governments, UN agencies, NGOs, civil society, and other key players. On June 29, 2006, in Panama City, the UN/ISDR Regional Unit convened a preliminary consultation meeting in order to make headway on this process in Latin America and the Caribbean. The main goals of the gathering were to convey information about the current progress on the strengthened ISDR system, foster a regional commitment to the process, and encourage contributions at the regional level. The meeting also aimed at identifying regional disaster reduction priorities for the Joint Work Plan of the ISDR system, discussing the most appropriate format to capture these priorities and, along with governments, developing a regional preparatory process for the first session of the Global Platform for Disaster Risk Reduction.